Democrats • Peter Corroon is elected state chairman, and Doug Owens is nominated to run against Mia Love. Scott Sommerdorf | The Salt Lake Tribune Peter Corroon, former two-term Salt Lake County mayor, will lead the Utah Democratic Party. 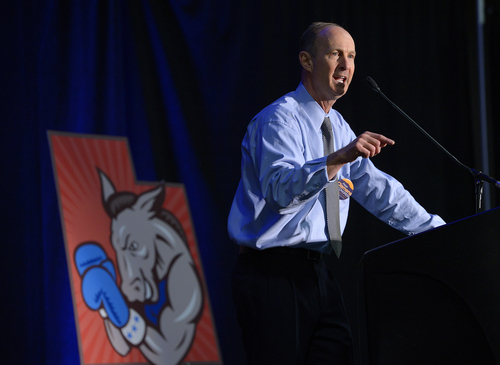 He defeated Richard Davis, a BYU political science professor, at the Utah Democratic Convention, Saturday, April 26, 2014. Scott Sommerdorf | The Salt Lake Tribune Delegates vote in the runoff election for the 1st Congressional District candidates Donna McAleer and Peter Clemens at the Utah Democratic Convention, Saturday, April 26, 2014. 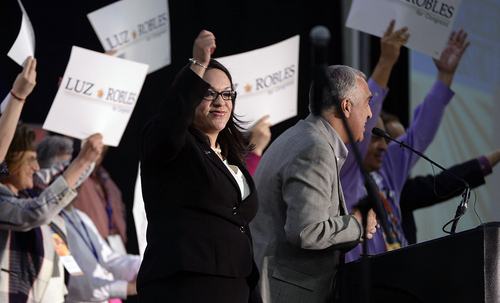 Scott Sommerdorf | The Salt Lake Tribune Luz Robles, candidate for Congress in Utah's 2nd Congressional District, takes the stage at the Utah Democratic Convention after being introduced by Salt Lake District Attorney Sim Gill, right, Saturday, April 26, 2014. Scott Sommerdorf | The Salt Lake Tribune Donna McAleer speaks prior to a runoff vote between her and Peter Clemens for Utah's 1st Congressional District nomination at the Utah Democratic Convention, Saturday, April 26, 2014. 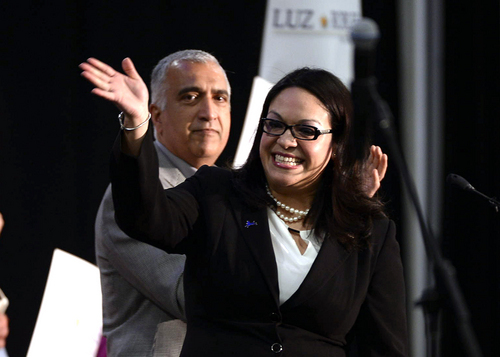 Scott Sommerdorf | The Salt Lake Tribune Luz Robles, candidate for Congress in Utah's 2nd Congressional District, takes the stage at the Utah Democratic Convention after being introduced by Salt Lake District Attorney Sim Gill, Saturday, April 26, 2014. 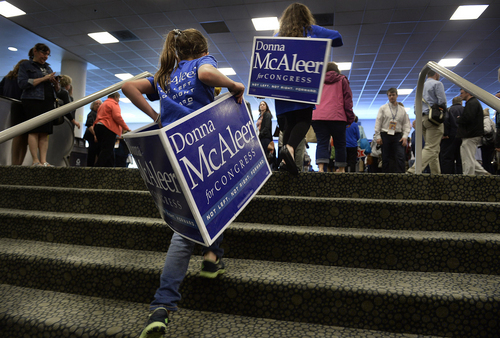 Scott Sommerdorf | The Salt Lake Tribune 10-year old Carly McAleer, left, and her friend Sophia Bernasconi don campaign signs to campaign for Donna McAleer at the Utah Democratic Convention, Saturday, April 26, 2014. 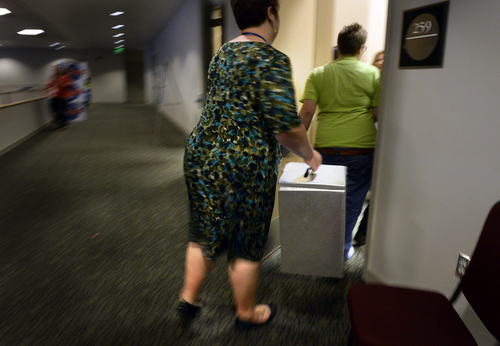 Scott Sommerdorf | The Salt Lake Tribune A ballot box is whisked away to be counted during a break at the Utah Democratic Convention, Saturday, April 26, 2014. Scott Sommerdorf | The Salt Lake Tribune Peter Clemens, candidate for Congress from Utah's 1st Congressional District, speaks at the Utah Democratic Convention, Saturday, April 26, 2014. 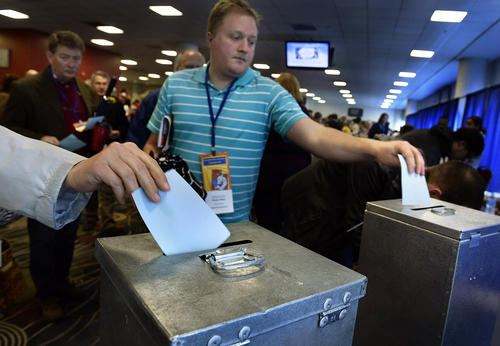 Scott Sommerdorf | The Salt Lake Tribune Volunteer Joel Otterstrom guards a ballot box along with his 4-year-old daughter Betty, right, as a delegate votes at the Utah Democratic Convention, Saturday, April 26, 2014. 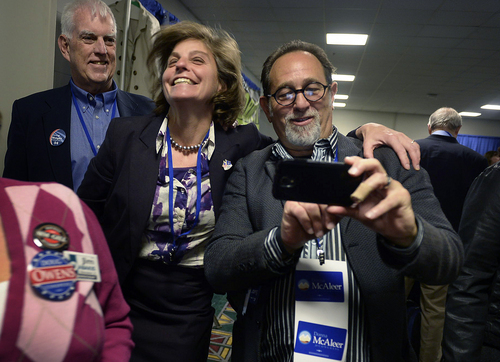 Scott Sommerdorf | The Salt Lake Tribune Donna McAleer celebrates her victory for the Democratic nomination in the 1st Congressional District as a supporter prepares to make a photo with her at the Utah Democratic Convention on Saturday. She defeated Peter Clemens in a second ballot. 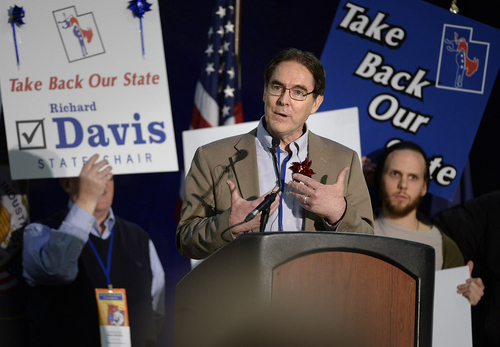 Scott Sommerdorf | The Salt Lake Tribune Richard Davis, a Brigham Young University political scientist, lost to former Salt Lake County Mayor Peter Corroon in the race for Democratic Party chairman at the Utah Democratic Convention, Saturday, April 26, 2014. Scott Sommerdorf | The Salt Lake Tribune Peter Clemens speaks prior to a runoff vote between him and Donna McAleer for Utah's 1st Congressional District nomination at the Utah Democratic Convention, Saturday, April 26, 2014. 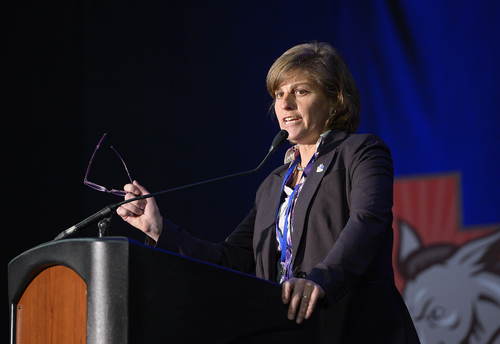 Scott Sommerdorf | The Salt Lake Tribune Donna McAleer, candidate for Congress from Utah's 1st Congressional District, speaks at the Utah Democratic Convention, Saturday, April 26, 2014. 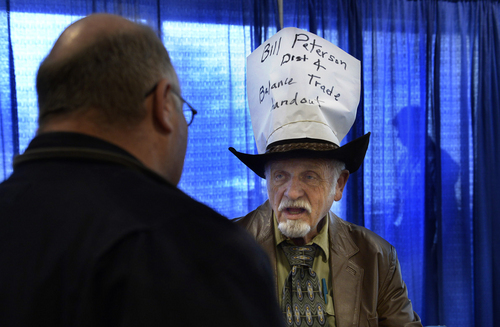 Scott Sommerdorf | The Salt Lake Tribune 4th Congressional District candidate Bill Peterson, who altered his cowboy hat into a political sign, talks with Michael Dorsey, left, during a break to count votes at the Utah Democratic Convention, Saturday, April 26, 2014. 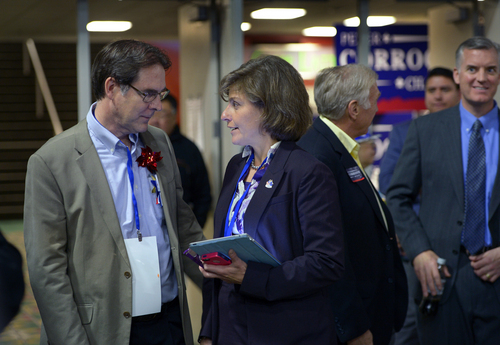 Scott Sommerdorf | The Salt Lake Tribune 1st Congressional District Democratic nominee Donna McAleer speaks with Richard Davis, left, about the need for a second ballot to avoid a primary with Peter Clemens at the Utah Democratic Convention, Saturday, April 26, 2014. Peter Corroon, who beat Davis in the chairman's race, is at right. Democrats chose a familiar face Saturday as their new state chairman: former Salt Lake County Mayor Peter Corroon. 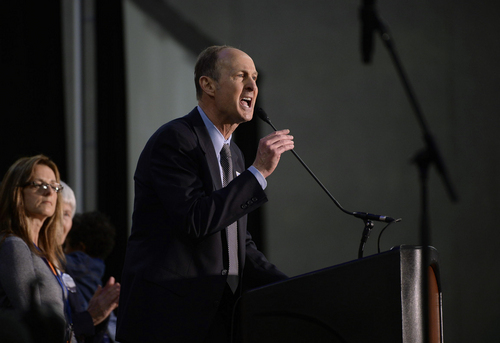 The Utah Democratic Convention also nominated Doug Owens  the attorney son of former Rep. Wayne Owens, D-Utah  to face Republican Mia Love in the 4th U.S. House District race to replace retiring Rep. Jim Matheson, D-Utah. 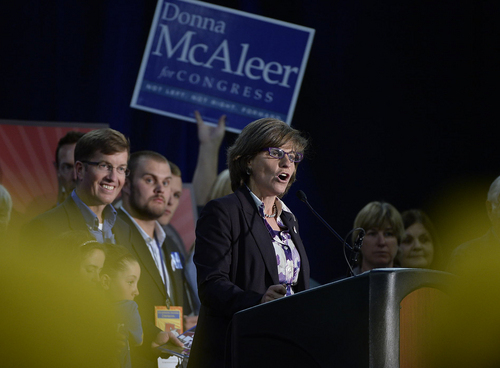 In the 1st Congressional District, Donna McAleer won the Democratic nomination for a rematch of her 2012 race against Rep. Rob Bishop, R-Utah. In the hotly contested race for party chairman, Corroon won 68 percent of the vote to 32 percent for BYU political science professor Richard Davis. 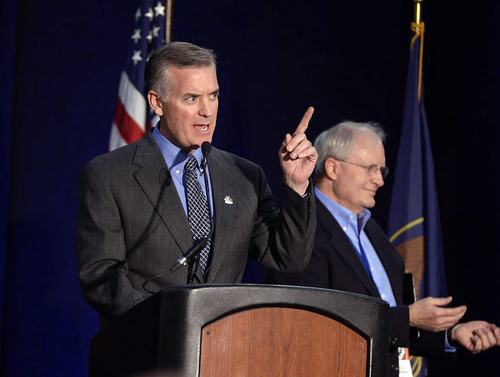 Davis campaigned as a Mormon who said he could convince fellow Mormons to support Democratic candidates, while Corroon urged attention to bread-and-butter Democratic core issues, from equality to living wages and affordable health care. "I can persuade hundreds of thousands of Utah voters to vote for Democrats across the state," Davis said. "With one vote for me you can cause hundreds of thousands of Utah voters to take a second look at our party." But Corroon countered, "Let&apos;s focus on what matters: good jobs, reasonable pay, decent health care, a decent place to live, the ability to live our lives without discrimination and a helping hand where we need it." Corroon even managed to win the biggest applause of the day in an earlier meeting with the LDS Democratic Caucus at the Calvin L. Rampton Salt Palace Convention Center in Salt Lake City, saying he can relate with its struggles with church members who say it&apos;s impossible to be a good Mormon and a Democrat. "As a practicing Catholic, I&apos;ve had a similar experience. Somebody said, &apos;Why do you come to church and you are a Democrat?&apos;" he said. "It&apos;s because I listen in church." He told the LDS caucus, "We stand for the issues that are important to people, taking care of those in need, taking care of the less fortunate. I think that&apos;s why we should stand up and be proud as Democrats." Corroon told the LDS and Hispanic caucuses that building support with those two groups is the key to future success for Democrats in Utah. He said Latinos traditionally vote Democratic, but less than half of those eligible actually cast ballots. Corroon, who replaces Jim Dabakis, who resigned last month because of health concerns, also vowed to build the party statewide. "We can pat ourselves [on the back] in Salt Lake County, but until we get out and have organizations in each of the counties, we&apos;ll never be successful in the state as a whole. There are some counties where the Democratic Party doesn&apos;t even exist, and we have to change that," Corroon said. It took two rounds of voting for McAleer to beat physician Peter Clemens in the 1st District, finally achieving 66 percent of the delegate vote. If candidates win 60 percent of the vote, they skip a primary and advance directly to the general election. In the first round, she was two votes short of that 60 percent  and four delegates had abstained. "I&apos;m not sure why you run for delegate if you&apos;re going to abstain," she said. She successfully urged candidates to help her avoid a primary, arguing she spent a quarter of her budget two years ago for a primary that attracted only 6,000 voters  and then lost to Bishop by a 75-25 margin. Clemens argued the convention should not be a coronation, and said he is better positioned to beat Bishop in the general election as an Ogden resident than can McAleer, who lives in Park City. After the win, McAleer, a West Point graduate who is a former world-class bobsledder, said, "This gives us two months of time, energy and resources to focus on taking out a six-term incumbent who has not supported Utah in his votes." "We need to get our country back on track  not left, not right, but forward," she said. Democrats and unaffiliated voters outnumber registered Republicans in the district, she added, so she could win. Owens easily won a race for the 4th Congressional District nomination seat against retired engineer Bill Peterson, winning 98 percent of the delegate vote. "I want to offer common-sense solutions that will appeal to rational Republicans, and they are going to cross over and we are going to win," Owens told delegates. He earlier told the LDS Democratic Caucus, "I am a Democrat because I am LDS. I think the values line up very, very closely…. I don&apos;t think Mia Love represents LDS values, frankly." Democrats also narrowed the field in one multi-county state Senate race. Clare Collard won the nomination to face incumbent Sen. Daniel Thatcher, R-West Valley City, after her convention opponent, LeGrand Peeples, withdrew. Clare Collard, by acclamation following a no-show by LeGrand Peeples.